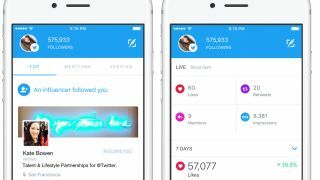 Twitter has launched a new app, called Twitter Engage, which is meant to help 'influencers' better #engage with their followers. That said, anyone can download the app from today (if you're on iOS and in the US, we expect it will roll out globally soon). Engage doesn't have a timeline; instead it's a dashboard that provides real-time stats about your Twitter activity. You can track tweets, see how many people have retweeted you, how many new followers you have, and all the other lovely metrics that will make you feel important. You'll also be able to see what your fans are tweeting about, so you can more effectively #engage your #brand with content that #connects. The Mentions tab will surface the "most important follows and mentions" from other influencers or people you frequently tweet with, while another tab is dedicated to verified users. Joking aside, we can see the value in having a safe space away from the nasty trolls of Twitter, but Engage is clearly only beneficial for celebrities and influencer types who prefer not to engage too much with the broader conversation. For the rest of us, we're probably best sticking to standard Twitter for now.